In order to keep your windows looking their very best, it’s a good idea to clean them at least once every few weeks. But if you’ve had trouble eliminating stubborn streaks and spots in the past, it could be because your cleaning technique needs a little improvement. 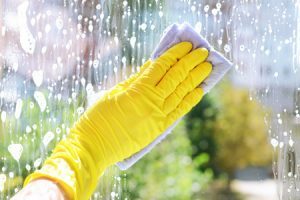 Today we’ll look at a few of the most common window cleaning mistakes we see, so that you can get the best possible results from your efforts. You might think that washing windows on a sunny day is ideal. After all, won’t sunlight make it easier to see spots and smudges? Maybe, but it can also make it harder to prevent streaking. Direct sunlight will often dry your windows too quickly and cause streaks to develop before you can wipe them away. Generally speaking, it’s best to clean your windows on mild, overcast days instead. There are many chemical cleaners that are way too strong to use on windows. Some people choose to use them anyway, and wind up with disappointing results. These harsh chemical cleaners can not only attract dust, but also shorten the lifespan of your windows. Use cleaning products made specifically for windows whenever possible, or make your own DIY glass cleaner at home! A window might look spotless when you’re standing right next to it, but later, when you look at it from a different angle, you’ll see all kinds of little blemishes. When cleaning your windows, step back every now and then and observe them from different angles. This will make it easier to eliminate spots and streaks that you might have missed before. Another mistake many people make is not replacing old, worn out window glass soon enough. No amount of cleaning is going to bring outdated windows back to life. If you think you could benefit from replacing the window glass in your home, call Affordable Glass & Mirror at (404) 361-5151 today.